STEVEN K. SCOTT is the author of A Millionaire's Notebook and Simple Steps to Impossible Dreams. 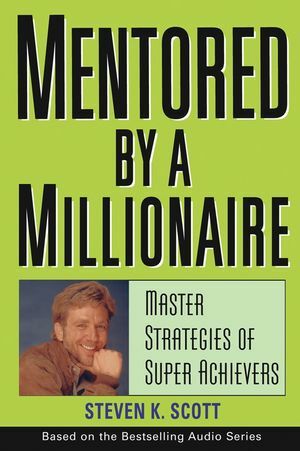 Mentored by a Millionaire is based on his bestselling Nightingale-Conant tape series, which became the number-one selling title of 2002. After failing in nine jobs, Steve discovered the power of partnering and launched more than a dozen multimillion-dollar companies from scratch, cofounding the American Telecast Corporation, which has achieved more than two billion dollars in sales. Session 1. A New Software Package for Your Brain. Session 2. Discovering Your Personality Type—You'll Like Your Style! Session 3. No Time, No Talent, No Money—No Problem! Session 4. Steven Spielberg's Masterful Strategy for Maximum Achievement in Minimum Time. Session 5. What You Say and How You Say It, Changes Everything! Session 6. Using Your Master Key to Open Any Door. Session 7. With This Technique You'll Super Achieve, Without It You Won't! Session 8. The Power Achievement Process of the Rich and Famous. Session 9. The Secret Strategy of the World's Most Successful People. Session 10. Simple Techniques for Unlimited Creativity and Persistence. Session 11. Removing the Single Greatest Roadblock to Achieving Your Dreams. Session 12. Bring On the Critics..... and Beat Them! Session 13. Taking Control and Keeping It. Session 14. It's Easy to Become Positively Amazing. Session 15. Discovering The High Octane Fuel of the World's Most Successful People.